Warning: If “the f-bomb” i.e. “foul” language offends you, you should NEVER listen to anything Gary says. Of course, he’s right. There is a whole lot more to life, to business, and to marketing (in the social media-powered world) than trackable metrics. In other words, when you build authentic, sustainable long term relationships—not only with customers but with prospects—you are building an asset that has real long term value. That’s the true meaning behind the literal meaning of “the social graph.” That’s the point of this post. Please allow me to explain. Over and over, we miss the point about so many things. We think abundance is about money when, as we all know (I hope), there are much more important things in life. To me, these more important things are “true abundance.” And yet, we think social media marketing can be encapsulated by how many “Likes” we get on our Facebook page, or even by how many zeros there are at the end of the bottom line number at the bottom of this month’s revenue report. The “social graph” is the more geeky, technical term for your “tribe” or your network of influence which, in my view, is something that one builds by “leading with value” via social media and email marketing. Yet, we think the bottom line is the money, not the people. Wrong! The bottom line, assuming you want to stay in business for the long term, is the real relationships that you are able to create and maintain. That’s why understanding the social graph is so important. In fact, it’s so important that, just last week, it become the leverage point in a high profile business kerfuffle between Twitter and the hottest app at SXSW, a live video streaming mobile app called Meerkat. What’s Meerkat Got to Do With It? The Twitter vs. Meerkat story is an interesting business story because direct access to Twitter’s user base, i.e. 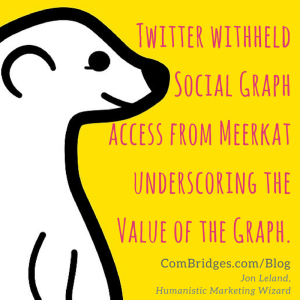 its social graph is what Twitter withdrew from Meercat. They did that because Twitter’s social graph is one of its most crucial assets. 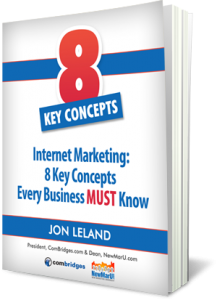 Likewise, so are your true followers, authentically engaged “fans,” and the email list subscribers, especially the ones who actually read and occasionally click on your emails. Their attention and TRUST are priceless/precious. It’s a complex issue how we all access each other’s social graphs and it’s debatable what is appropriate use for a start up app. Along these lines, I really appreciated the thoughtful analysis of VC/entrepreneur Mark Suster @msuster in his blog post: “Some Perspective on Twitter vs. Meerkat.” I think he explains the business issues involved quite well. And, that’s where the rubber really hits the road… not in terms of bottom line financials, but in terms of meaningful dialog, authentic give-and-take conversations where both parties listen as well as pontificate. Straight-up social media communications like this not only make for more effective marketing and sustainable long term relationships, but more importantly, they make this a better world!